A few years I had an epiphany one day while staring at my long distance phone bill. Most of my friends and family lived within a local radius, and nearly all my communication (both business and personal) was done via cell phone. So why was I paying for a service I so rarely utilized? In fact the very concept of landline phones in the home was beginning to seem archaic to me; dial a landline number and you call a location, dial a mobile phone number and you’re calling the person, right? At that moment I chose to join the growing number of former landline subscribers. I haven’t regretted that choice yet. Now I’m having yet another such epiphany – with my cable bill. Each month I give the vacuous vortex of Hell, better known to the wold as Comcast, a princely sum of $110 for bundled high-speed internet and TV packages, with $60 of that making up the latter half of the extortion money, err bill. I could count the number of cable networks I watch, infrequently as I do, on one hand. My 42” Plasma TV sees more use as a game portal than anything else. Most of my day is spent perched in front of some form of computing display. When not writing code and designing the internets, I’m reading tech news sites. When I’m not reading tech sites, I’m writing for tech sites. When I’m not engaged in those activities I’m either watching my favorite streaming media content (via iTunes, Hulu, Joost, etc.,), or killing Nazi Zombies on PC and Xbox 360 – hey, someone has to save the free world from flesh-eating Fascists. When I’m not doing those things, well… let’s just leave it right there, shall we? 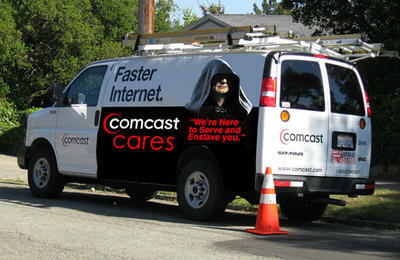 Needless to say my limited television viewing hardly justifies blowing $50 kisses to Comcast each month – a company I am least fond of (each time I call their customer support I half expect Chancellor Palpatine to answer, “Vader! How’s my favorite Sith?”) Enough! So I’ve decided to cut the cord, or cable such as it is, going on a cable-free diet. Rather like an all-natural fiber diet, without the grainy food and explosive diarrhea. You’re saving money and trees, A WIN WIN! This will be an ongoing series as I examine different solutions to bring online content into the living room. I’ll be reviewing different products, walking you through the setup process and giving you and inside look at what to expect. But more importantly I’ll be showing you what works and what doesn’t. In a nutshell, I fry all the electronics in my living room so you don’t have to. Think of me as your geeky secret service agent, taking the bullet for you. That’s love, or something. So follow my perils, mock my suffering, ask questions, and if you have some suggestions of your own please send them my way.